The CTOUCH Leddura and Runner are the latest generation of interactive large format LED touch displays, the screens are designed to look great in classrooms, meeting rooms, and are also equally suitable in public display areas. The multi-touch functionality opens the world of touch technology to large audiences helping to increase engagement, involvement and collaboration. All Ctouch interactive LED Screens are shipped with a 3 user licence of Ctools plus software featuring all the tools required to provide inspirational seminars, meetings & lessons with a range of backgrounds, images and interactive media. Ctouch is also included which allows greater imperativeness between presenters and audiences by providing collaboration between other devises like iPad, Android tablet, laptop, smart phone and across all platforms Windows, Mac and Linux. Available in either LCD or LED format. With LED technology you can benefit from significantly reduced power consumption, up to 60% compared to LCD technology, this will reduce the cost of ownership over time, and aid organisations who wish to reduce their carbon footprintst of ownership over time, and aid organisations who wish to reduce their carbon footprint. Four people can simultaneously write, perform mouse functions, erase and manipulate objects on display. 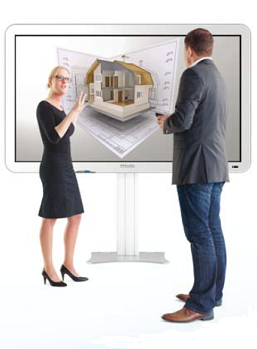 Displays are available with 10 points of touch for further enhanced collaboration. Use simple, intuitive hand and finger gestures to work with content, including one and two finger navigational gestures such as panning and flicking pages and objects. You can also configure your own personal gestures such as displaying the on-screen keyboard, toggling or minimising all applications to the desktop. The displays feature an attractive design that looks good in any classroom, boardroom or public area, without compromising on the durability of the product. All CTOUCH displays feature 5mm toughened anti-glare or clear glass screens, designed to survive the demands of any environment. With no need to install drivers on Windows, Mac or Linux devices, installation and operation is quick and easy, even for first time users. Long life is assured by the typical 45,000 hours of panel usage, which equates to over 15 years of average day to day operation. CTOUCH displays have no cooling fans, eliminating the distracting noise often associated with projectors. Apart from cleaning the glass, minimal maintenance is required. CTOUCH displays are supplied with a three year on-site, next working day, de-installation/re-installation warranty to minimise downtime in the event of failure. Optionally this can be extended to five years in total. All CTOUCH displays can be wall mounted in either landscape or portrait mode. A full range of wall lifts, trolleys and trolley lifts and tilting tables are also available. CTOUCH Interactive Touch Displays make it easy to create effective, eye-catching teaching materials and promote a style of active, visual-based teaching and learning that makes the classroom fun for both the teacher and students. Interactivity creates a more meaningful, socially rich experience than spoken word tutorials alone. Interactive displays provide the opportunity for students to engage directly during lessons. Interactive learning experience Touch technology allows ‘hands-on’ manipulation of content, encouraging students to work collaboratively with their peers. It also provides new opportunities to share accumulated knowledge through project based learning experiences. Whether you are imparting new skills or launching new methods and processes within your organisation, CTOUCH interactive displays can help you connect and share with colleagues, partners and employees. Keep everyone involved – exchanging ideas, participating in interactive presentations, reviewing documents, brainstorming and contributing to projects in real-time. Enhanced collaboration Encourage participants to engage, interact and work together during meetings, fostering communication, building teamwork and driving successful results for your organisation. Engage attendees, assess understanding of key concepts and encourage full audience participation to elevate training efficiency. Save valuable time and money by distributing important information to colleagues and meeting attendees immediately, eliminating the need for typing up flipchart notes.